Clean silhouette bezel and dial with delicate curly arrows and roman numerals in the imperial style sparkling loose diamonds that adorn these royal watch. 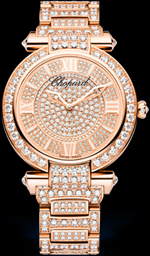 The final touch exquisite novelty – is inverted diamonds on lugs and crown. Two central skeletonirovannye arrows carry the indication of hours and minutes. Assembled an amazing model Imperiale mechanical self-winding caliber, and 60-hour power reserve.